Fiat began its 500 model back in 1957 and since then the small economy car has evolved itself into a range of models offering various engine options to carry beautiful body. Our model for the day is Fiat 500X Trekking Plus 2016 which is intended to make an entry in compact crossover segment. 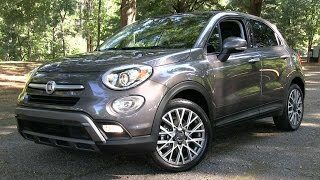 Let us have a look at Fiat 500X Trekking Plus 2016 review and get to know about all amalgamations. Interior of Fiat 500X Trekking Plus 2016 is well equipped with safety features adored with comfortable arena. Taking a lap ahead of regular 500 models the new version gets an Uconnect infotainment system mounted over dual tone dashboard. There is an option for the screen covering a 5.0 inch variant and a 6.5 inch one. The latter also includes satellite navigation with 3D maps and ‘One Shot Voice Destination Entry’. The sportier Fiat 500X Trekking Plus 2016 gets more into its class with the DAB sound system that makes your entertainment louder and clearer over the rough terrains. Cabin looks highly luxurious with its dual tone scheme. The seating area over the leather upholstered seats comes drenched in black while the rest come dipped in creamy color. In front of the three gauge instrument cluster sits a flat-bottom almost oval shaped steering wheel covered in black. Rounding up the entire details regarding the interior of Fiat 500X Trekking Plus 2016 you have class, comfort and luxury; all amalgamated together to enhance your driving experience. The exterior of Fiat 500X Trekking Plus 2016 is adorned with unique looks when compared to rest in its line. Especially the satin silver accents that give the entire look a sportier touch look truly stunning. Starting with the front fascia of Fiat 500X Trekking Plus you have a sporty touch over the aggressive looking bumper that comes with in inculcated air vent to pass some fresh air to engine and brakes. Besides it sit tiny indicators on both sides while the fog lamps get oval shaped look, resembling to that of headlights and add commendably to the overall front fascia of Fiat 500X Trekking Plus. Moving at the back you’ll notice a bit of slope starting from the roof till the trunk lid. Curved square shaped taillights sit at both the ends but major sight of attraction comes through the bumper which comes with an exhaust pipe colored to match the arena. The US version of Fiat 500X Trekking Plus 2016 will be offering two engine variant to its buyers. The first one here will be a 1.4 liter turbocharged four-cylinder engine cranking total output of 160 hp and peak torque of 250 nm while the second option is a powerful 2.4 liter engine generating total output of 180 hp and peak torque of 230 nm. Both these guises will be paired to nine-speed automatic transmission on all wheel drive mechanism.